I needed sticky custom post types for a client project but found out that WordPress doesn’t support this out of the box. Luckily it turned out to be pretty simple to add in that functionality with just a little bit of code… which I have turned into a plugin for everyone to use! YAY! 1. Download the plugin from wordpress.org. 2. Upload sticky-custom-post-types.php to the /wp-content/plugins/ directory. 3. Select custom post types you want to enable with the sticky function on the ‘Settings → Reading’ page. Unless you’re using custom queries to display your sticky posts, you probably also want to check the option to display selected post types on the blog home. 4. 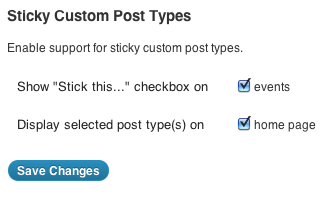 When adding/editing a custom post type, check the “Stick this to the front page” checkbox if you want to stick that custom post to the front page. Unfortunately there’s no way to put the “Stick this…” checkbox in the same place as it is on the built-in “Posts” add/edit page (to do so would require modifying core code), but I think that having it display immediately is actually a lot more straightforward than having to click through the visibility setting edit link to get to it. You are currently browsing the Ann Oyama weblog archives for August, 2011.